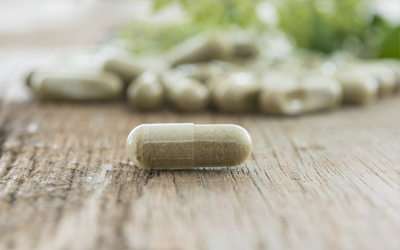 I get a lot of e-mail questions about medicinal supplements and histamine intolerance, so I’ve written this blog post to answer the most common questions. I am not recommending that you take any of these supplements. A wide variety of supplements have been reported to help, so it is impossible to make any definite recommendations. You need to figure out what works for you. I would strongly suggest experimenting systematically - carefully introducing one supplement at a time and objectively deciding if it is helping (or if it is making your symptoms worse). Keep your doctors and pharmacist informed about your medicinal supplements. Interactions between supplements and medications commonly occur. Please see the blog post: Diamine Oxidase Enzyme (DAO). NeuroProteck was developed by Dr. Theo Theohardies, a respected physician in the mast cell medical community. It contains three flavonoids: luteolin, quercetin, and rutin. Unfortunately, when I called the company that sells this product (Algonot), I was told that there was research regarding mast cell disease, but I would have to find it on the internet myself. It is unusual that Algonot does not make this research available on their website. Most companies with research to support their product are happy to share it. When I searched for clinical research on NeuroProtek, I found one case series in children with autism spectrum disorders (PubMed ID 22697063). A case series is a report of people that used the supplement and can suggest a potential benefit, but the evidence is not nearly as strong as a clinical trial where the supplement is compared to a placebo. Hopefully, more studies are coming. A few studies have investigated the benefit of curcumin in allergy, primarily respiratory/eye allergy (curcumin applied to the nose or eyes). One study investigated the effect of oral curcumin in mice that were allergic to egg (i.e., had IgE mediated egg allergy). Curcumin ingestion decreased mast cell proliferation and activation (pub med ID 26147007). These results are very interesting and suggest a possible role for curcumin as an intestinal mast cell stabilizer. However, the results should be interpreted with caution, because: 1) This study was done in a rodent model, and may not apply to humans. 2) It was one, small study. 3) The rodents had IgE mediated egg allergy, which may not apply to conditions where mast cell activation is not IgE mediated. More research is necessary before making any firm conclusions. Ironically, there is interest in curcumin as a beneficial supplement, but low histamine diets usually restrict curry. Quercetin is claimed to help a long list of ailments, including allergy. A few animal and test tube studies have shown a potential benefit, but how it may help is not known. Mast cell stabilization is one theory. Another complication is that like most supplements; the processing method is not standardized, and two products may be very different. High levels of supplemental vitamin C is one of the most commonly reported beneficial supplements in mast cell activation and histamine intolerance. Vitamin C is an essential nutrient. The recommended daily allowance is 75 mg/day for adult women (varies with gender and age). A few fruit and vegetables servings would exceed this amount. Limited research suggests that vitamin C may reduce histamine levels in the blood. Also, a German research group proposed that vitamin C may reduce nausea in patients with mastocytosis. The potential for vitamin C to reduce symptoms would be unrelated to its nutritional role. For most nutrients, experts have determined an upper tolerable limit. Side-effects are more likely as your intake increases beyond this amount. The upper tolerable limit for vitamin C is 2000 mg (2 grams) per day. Vitamin C side-effects include digestive upset (diarrhea, nausea, vomiting, heart burn, bloating) and kidney stones. Start with a small amount and slowly increase. If you take more than 2000 mg (2 grams) per day, talk with your doctor or pharmacist. There is not enough information to recommend one brand over another. As with other herbal supplements, choose a product from a reputable company. Take half a teaspoonful of the mixture in a cup of warm water. A second dose can be taken 20-30 minutes later if symptoms have not completely resolved. Before taking this mixture, please discuss it with your medical doctor. Potassium can be dangerous in some medical conditions. Digestive enzymes break food down so that the body can absorb the nutrients. A lack of digestive enzymes can lead to malnutrition. Also, undigested proteins, carbohydrate, and fats in the digestive system can cause digestive upset. For example, undigested fat will lead to diarrhea with pale, greasy, foul smelling, stools that tend to float (steatorrhea). Undigested carbohydrate can lead to gas and bloating. Undigested proteins may be a factor is some cases of food allergy and digestive system inflammation. Rest for about 30 minutes after eating (or low activity). If these changes are not helpful, and you feel that poor digestion is a factor in your health, digestive enzymes may be worth trying. There are hundreds of formulations, each with a different mix of enzymes. If you suffer from steatorrhea (see above), then a product with a higher level of fat digesting enzymes (e.g., lipase and bile) may be helpful. One of the most common enzyme supplements is lactase. Lactase breaks down the sugar in milk (lactose) and can be effective if dairy products cause gas and bloating. The large intestine (or colon) is home to hundreds of different micro-organisms. Most of them protect us, but there are also pathogens (harmful micro-organisms). Everyone has a different mix. Dysbiosis means there are too many pathogens, which can lead to a long list of digestive and overall health problems. Probiotic supplements (living micro-organisms, usually bacteria) are often recommended to change the mix of intestinal micro-organisms. Probiotics can be helpful for conditions, such as pathogenic diarrhea, ulcerative colitis, irritable bowel syndrome and eczema (infants). Many websites suggest that certain probiotic products either increase or decrease histamine levels. Unfortunately, there is no research to support these claims. ‹ How much do we really know about the low salicylate diet? Awesome article! Would love to see more. Thanks for the kind words! I add a new article each month. You can sign-up to receive updates at: updates.